A beautiful white wedding here in the western half of the world is so much nicer than a white funeral in the eastern half. Our brides wear white on their joyous day. Our eastern counterparts wear white when someone they love dies. Yet, we all want the same thing—to experience the kinds of joy in life such as that which weddings bring. As a Christian, I’m looking forward to that day when Christ calls His followers home and we have that grand and wonderful event. Like no wedding celebration ever before, when the Son of God claims His bride, the church. But what I’ve been learning on the journey of life is that, in order to fully enjoy the plans God has for us here on earth and later in heaven, we need to go through a sort of funeral first. As I was reading the devotional book My Utmost for His Highest by Oswald Chambers, he explained that as Christians we must have a sort of funeral for our life, our ambitions, our plans, that we must wear the metaphoric white funeral garments. Then, once our life is dead and buried, we can allow Christ to live His life through us. As I was writing Captured by Moonlight, this truth came alive for me in my Indian character Eshana. When Eshana became a Christian, she turned her back on her Hindu traditions, and wore bright clothing to show her new-found joy in Christ. Her traditional Hindu uncle sees this and becomes angry. He kidnaps Eshana and forces her to have her head shaved again, and to wear course white widow garments—like funeral clothes. What Eshana learns in the book is what I’ve been learning, that we can trust God, believing that His plans to use our lives for His glory, are in truth more marvelous than anything we could ever devise. Even if it hurts for a while, like in the case of Eshana. Who of us doesn’t or hasn’t been hurt in some manner in our lives? We hate that aspect of life, but maybe we can surrender in trust to God. Give up what we think our lives should be like, and trust God to use even our heartaches and pain for something good. I wish I could say that I’m like Eshana in my book, in how bravely she stands for Christ, how she literally turns the other cheek when she is being abused. But I know that I am not. However, the lesson that Eshana learns is one that the Lord wants us all to learn—we must die to ourselves in order that He may live through us. I am learning that bit by bit. And Eshana’s story has even inspired me as the writer. How amazed I was one day in my devotions, to have the Lord remind me of the story I had written, as He urged me to follow in the example of my own fictional character as she follows Christ. Have you ever had to die to yourself to live for Christ? Can you think of other inspirational stories or characters who demonstrate dying to self? Have you read and enjoyed any of Christine's books? How lovely, Christine. Thank you for sharing those thoughts with us today. Your heart for Christ--the heart that makes your writing so beautiful--blesses me. 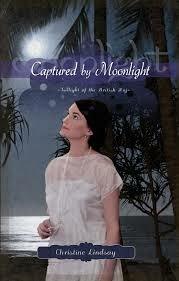 Shadowed in Silk was one of my top reads and I am so looking forward to Captured by Moonlight! I loved that example of Sandalwood. I think that the Indian Christians have one up on us in North America. Their faith costs them something, and yet, their standard religions are based so much on being servants and having humility. This is so different for the Americans, especially, who are so entrenched in a John Wayne culture of not relying on anyone else and being strong. thanks again for visiting the Inkwell. I wish you amazing success with this new book! I think Christine might be traveling today, but hopefully she'll be able to stop by at some point. I related to the part about God speaking to us through things we've written. It's sort of an "ouch" moment, but also very powerful. Paul said something to the effect of "I die daily." Not a pleasant thought unless you keep in mind that everything God asks us to lay down is because there's something better for us ahead. Love these thought-provoking Thursday posts! It's a hard calling. I agree, Niki. Hard to wrap our brains around. Thank you Dina for having me as a guest today. I so agree, their is such an 'ouch' moment when what we write is what God sometimes uses to teach us or remind us of some area that we are failing in. And Debra, what a beautiful reflection on the metaphor of sandalwood, and how Eastern Christian are so culturally geared to servanthood. I never saw that in such a clear way before. And so true, Niki, there is so much ahead for those who believe. You have all blessed me today with your thoughts. This is awesome, Christine. I'm so glad your own writing was able to be a source of your devotion. I can't even imagine how it must be to know you'll be facing punishment and yet to still give an outward showing of your belief in Christ. I know this does happen for real, and it seizes my heart with terror and awe at the same time. Looking forward to reading your book soon!